Project obstacles and solutions: Family Dollar is one of the fastest growing retailers in the U.S. As part of the Dollar Tree Corporation, Family Dollar is a major player in the small discount retail store wave that has seen 13,600 stores open in the U.S. and Canada in recent years. The Family Dollar in Terre Haute, Indiana is one of the latest neighborhood stores to open. These stores are small by design, typically encompassing only 7,000 square feet. They have competed well with larger-discount-big-box stores by focusing on local neighborhoods and small towns. This has created opportunities for local concrete finishers who can meet the construction specifications set up by the corporation. This was the case at the Terre Haute store. 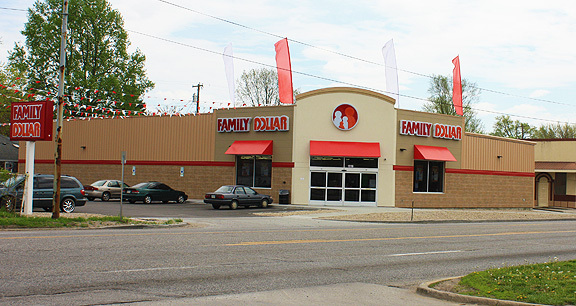 IMI has designed concrete footing and floor mixes for multiple Family Dollar stores. There are three critical components to finishing concrete floors for Family Dollar. First, the concrete is the finished flooring for these stores. The concrete is polished and any imperfections in the concrete or bad finishing techniques will cause problems. Troweling is particularly critical. Chavez used a hard trowel finish to create a smooth surface that would polish to a high gloss. The second critical aspects of this floor were the flatness and levelness. Family Dollar specifies a very flat floor rating. Chavez used a laser screed to level the concrete during the pour to get the FF/FL rating to meet the engineering specs. The third critical component of this job was the temperature when the floor was poured in October. With the ground temperature and the air temperature at a great variance, it was necessary to use an admixture to speed up set times. If the surface of the concrete, which is influenced by the surrounding environment (air temps, humidity, windy conditions) is setting up quicker than the lower portion of the slab, which is influenced by the ground temperature, scaling, curling and cracking is bound to happen. IMI mixed an accelerant into the concrete to keep the set times even throughout the depth of the slab. Construction on this type of retail store is very fast paced. The Terre Haute Family Dollar opened for business in March 2016, just five months after the floors were poured. For more information on finishing retail floors, contact the IMI sales representative for the location nearest you. Click here.